Here you’ll find everything you need to know about sorting waste in your home and when it will be collected in your area. 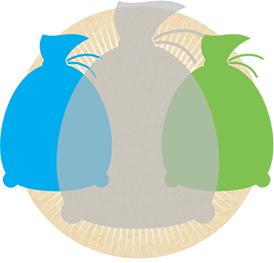 The 3-Bag Waste Sorting System is designed to make sorting waste in your home easier than ever before. Download the new Sorting Guide or use the new Sorting Tool to quickly find out what goes where. With the new 3-Bag Waste Sorting System, we had to make some changes to the way your waste is collected. Select your Area below and click to download your new Collection Schedule. You can also type in your address below for a personalized Collection Schedule. Collected every second week – alternating with clear Garbage bags. Remove any crusts or leftover cheese and place the box in the blue Recyclables bag and the paper in the clear Garbage bag. Empty and quickly rinse metal and plastic containers with cold water; it only takes a second or two. As long as nothing will leak, drip or spill out onto the rest of your recyclables, it’s clean enough for us! Scrape off excess food and fold or crumple the dirty side in. Collected every second week – alternating with blue Recyclables bags. They are preferred in the clear Garbage bag, but may go in the green Organics bag on weeks the clear Garbage bags are not collected. To prevent mechanical sorting equipment from becoming entangled and breaking, place these items in the clear Garbage bag. Any soft plastic like cereal or cracker bags, chip and snack bags, stretch wrap/film, soft plastic packaging, plastic wrap, cheese and sandwich meat packaging all belong in the clear Garbage bag. Although we prefer green bags, orange and paper bags can be used for leaves and yard waste only. Southeast Eco360 will safely dispose of your Household Hazardous Waste free of charge at our on-site HHW Depot or through our Mobile Eco-Depot program. HHW can be dropped off at the Depot in Berry Mills for free during regular operating hours (location and hours can be found here). Please refer to our Sorting Guide for acceptable HHW materials. Southeast Eco360 does not dispose of industrial, commercial or institutional hazardous waste. For residents looking to get rid of their batteries, they can bring them to our Mobile Eco-Depot, our on-site HHW Depot, or to various drop-off locations throughout Southeastern NB. Large waste and bulky items like household appliances, furniture, large electronics, large toys, etc., are not suitable for your regular household waste. These items can be disposed of at Southeast Eco360’s Solid Waste Facility (see fees). Alternatively, you can dispose of these materials at your curb during your Special Cleanup organized by your Municipality or the Department of Environment and Local Government. For your cleanup dates, contact your Municipality or Department of Environment and Local Government if you are in a Local Service District. Southeast Eco360 is responsible for proper disposal of solid waste, but not waste collection. Waste collection is the responsibility of your Municipality or the Department of Environment and Local Government if you live outside a municipal jurisdiction (i.e. in a Local Service District). Click here to see the contact information for waste collection inquiries (pickup schedules, special or bulky item collection days, issues, etc. ).